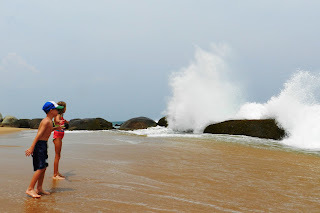 Ok, ok, I know I'm delinquent with this follow-up post regarding our second stop in Sri Lanka...but let's pretend, like most things in Sri Lanka, the slow pace simply adds to the experience. If you want the fast video version of our safari trip - here you go. (Jennifer's note: Watch it! It's worth it just for Sophia's "IT'S A JACKAL!" discovery.) For all the details, keep reading! 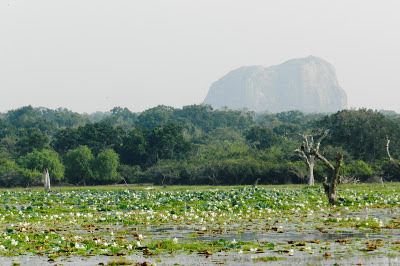 After Galle, the next stop on our visit was the Yala National Park on the South Eastern tip of Sri Lanka. But before we could enjoy the wildlife that awaited us, we again hopped aboard Ruwan's van for a harrowing road trip through small villages, bustling street side markets and some absolutely beautiful coastline. A short way into the drive, we stopped to watch some local fisherman located just off the beach. 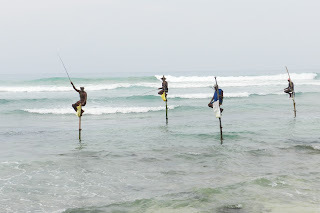 These "stilt fishermen" are apparently a relatively common sight on the Southwest Coast of Sri Lanka, but for us, it was quite unusual. This method of fishing is said to have started in Sri Lanka after WWII, as fishermen tired of fighting for a spot on the coast's rocky edges and began using large metal posts left over from the War to perch themselves above the water. Soon others realized a sturdy piece of wood would work just as well, and thus, "stilt fishing" was born. Like us, you may ask why they don't simply use nets?? The answer, we were told, is that stilt fishing doesn't disrupt the fish as dramatically as the nets, and therefore, the fish continue to visit the waters close to shore. Disturbing them would cause them to relocate elsewhere, forcing the fisherman to travel further off shore or to more isolated parts of the coast. Back on the road, we zoomed along through a number of small fishing villages before arriving at Chaaya Wild Yala, our accommodations for the next couple days, located just outside the Yala National Park. We had originally planned to stay in the National Park at a tented safari camp, but the government recently forced all such camps out of the park to preserve the natural habitat of the animals. Both Jennifer and my mom were more than happy to change plans and enjoy the comfort of air conditioning, king-sized beds, indoor bathrooms and a fully stocked poolside bar. 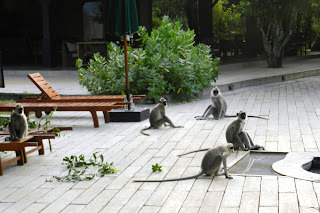 Truth be told, after arriving at Chaaya Wild Yala, I was likewise pleased we made the change. 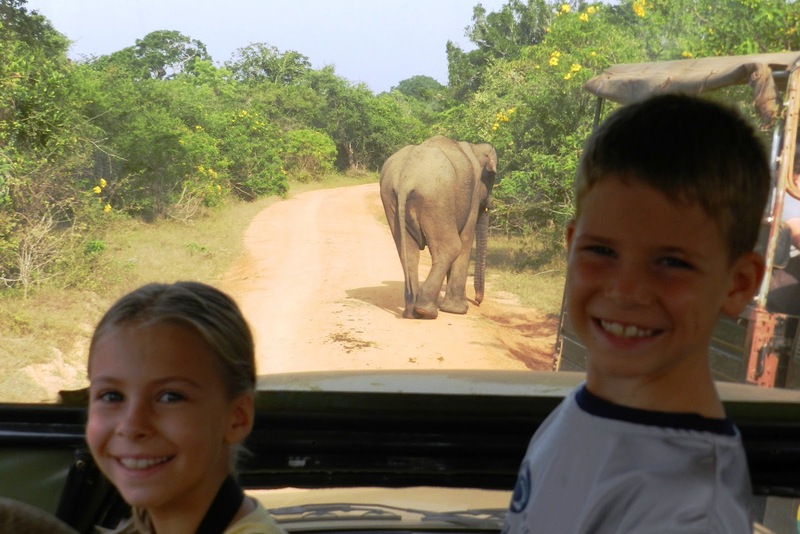 The location allowed for some unique encounters with the wildlife, even prior to hopping on a jeep for a safari. Wild boar and water buffalo often roamed the grounds of the resort at night and warnings were provided at check-in about wandering around the grounds alone at night for fear of the animals you may find....more likely, the animals that would find you. This turned out to be good advice, since the buffalo apparently enjoyed the grasses just outside the rooms, and we found ourselves enjoying a glass of wine with an unexpected water buffalo guest one evening. He didn't bother us, so we didn't bother him...besides, we only had one bottle, so we didn't offer him anything. We were also visited at the pool deck by a family of 10-12 wild boar one evening as the kids took a late night swim in the pool. And on our final morning at Chaaya, we found ourselves surrounded by 15-20 mischievous Langur monkeys who enjoyed an early morning drink from the pool and a romp on the poolside lounges and chairs. The resort is also just a few hundred yards from the ocean - with several rooms only feet from the beach. We didn't spot any wildlife on the beach itself (except the wild dogs that chased me from it at sunrise one morning....another story), however it was evident by several piles of dung that something large had visited recently. Closer to the water, and away from the dung, the kids were able to enjoy searching for shells with their grandmother, and we all enjoyed watching the rough surf pound the rocks at the shore line. If you visit Chaaya Wild Yala, don't miss the beach. While you really can't swim due to the rough surf, ... it seems to be a hidden gem. 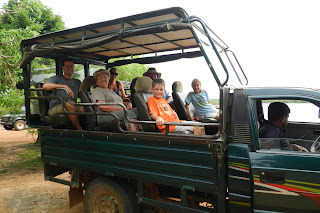 But before we even had a chance to check out the beach - and barely had a chance to get settled into our rooms - we were on the move, gathering cameras, sunscreen and bug spray, and climbing aboard our private 4X4 for our first safari! We had booked the safari directly through the resort, and I couldn't have been happier with our driver and guide, Priyantha. It was obvious from the start that he loved his job, loved the wildlife and enjoyed creating an experience we wouldn't forget. Even before we left the resort grounds, we spotted several beautiful birds, a large crocodile, and a Langur monkey bounding down the dirt road ahead of us. Upon reaching the park entrance, we became even happier with Priyantha as we saw firsthand how young and CRAZY some of the other safari drivers were! It's amazing there weren't accidents and flipped trucks throughout the park the way some of these guys drove. As we headed into the park, none of us were really sure what we would see, and we all had different opinions on what would be the most exciting. 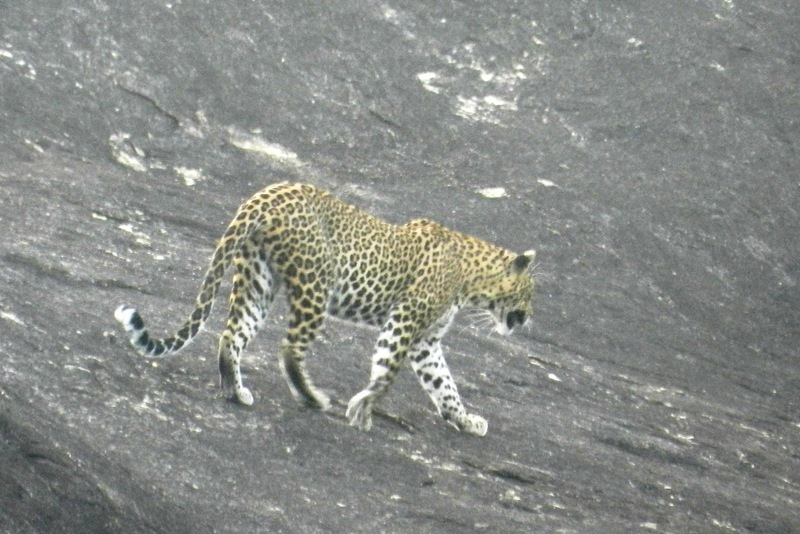 For me, I really wanted to see leopards in the wild. For Sophia, Jennifer, and my parents, I think elephants topped the list. For Cooper, who knows, but I think he was secretly hoping to see Batman - or better yet, a Quidditch match break out somewhere nearby (he's currently obsessed with Harry Potter). Luckily, we all got to see what we hoped we would. (except Cooper - no Dynamic Duo, no Hogwarts). I could write an entire book listing the variety of animals and amazing scenes we saw in the park. In fact, Sophia filled up a sheet of notepaper during dinner, doing just that. 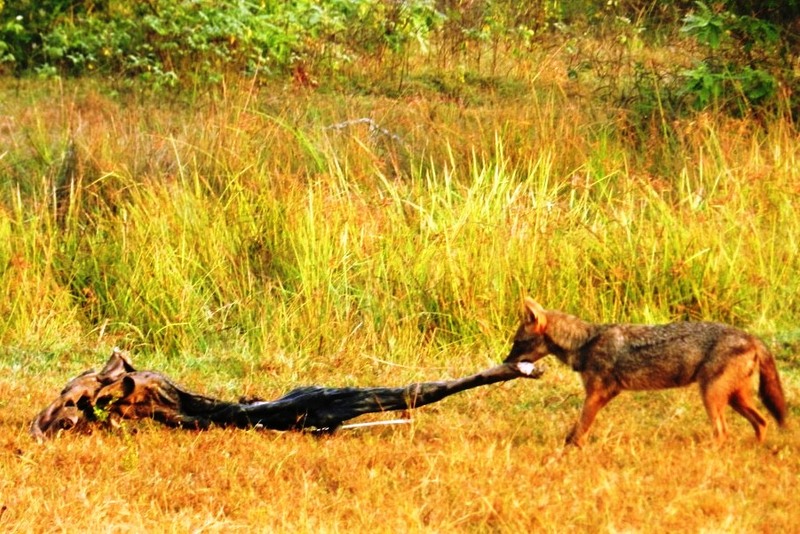 To name a few, we saw Asian elephants, leopards, monkeys, crocodiles, water buffalo, monitor lizards, spotted deer, wild boar - and one of the highlights, a pack of jackals. We also saw a large variety of beautiful birds, including bee-eaters, eagles, heron, egrets and peacocks. The first occurred on the day of our arrival, on our first safari. 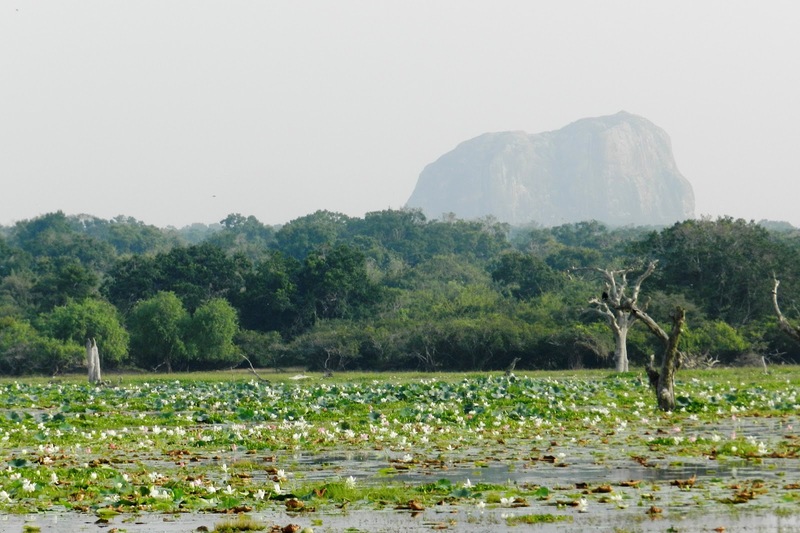 With hopes of seeing elephants and leopards, the trip began slowly, spotting crocodiles, monkeys, a variety of birds, and plenty of water buffalo. We were having fun, but after a while, I think we were all getting a little discouraged. About that same time, we spotted our first elephant - a pregnant elephant at that - making her way through some dense bushes and trees. Happy to see her, but disappointed she vanished quickly into the forest, we moved on. Soon, we came to an opening where we spotted four more elephants, including a baby. They were only twenty to thirty feet away and they were amazing. After watching them for a few minutes, Sophia spotted a pack of jackals moving across the open plain, ultimately converging on some sort of carcass. Like a scene from National Geographic, we watched as they grabbed hold and tore off pieces of meat, running off to enjoy their meal...pretty cool. The second occurred during our morning safari the following day. We set out before the sun was up, and arrived in the park just after dawn. After spotting several elephants the previous day, we all hoped to see more - as well as a leopard or two (and I think Cooper was now trying to spot Hippogriffs and Thestrals....poor kid, no luck again). We spotted more of the usual suspects on our way into the park, and Priyantha led us to an area where leopards often spend the morning. 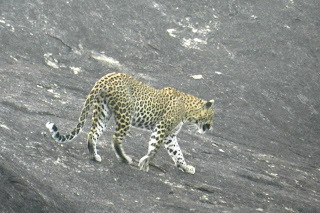 Lucky for us, and about another 15 or so people in the 2-3 Jeeps near us, we spotted a beautiful, large leopard as he sunned himself and walked across a large open rock face. He was maybe 30-40 yards away, but was easily seen against the dark rock. We watched him for about 2 minutes as he slowly placed one giant paw in front of the other and walked across the rocks, eventually disappearing over the other side. Apparently, though the leopards often come to this area, spotting one in the open was quite rare, so we felt very fortunate to have been in the right place at the right time. 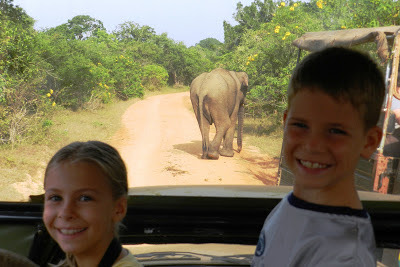 The final highlight came later that same day, and was the most memorable experience of our visit in Sri Lanka. After spotting a leopard earlier in the morning, we were all hoping to end our day with another elephant or two. 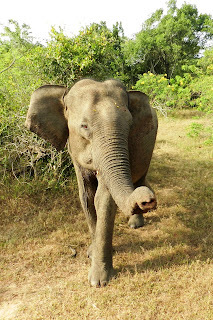 As with the leopard, Priyantha, masterfully guided us through the park down less travelled paths until we came across another jeep who had spotted a lone elephant in the tree line. We sat and watched for a minute with the other jeep, before they pulled away. About a minute later, we were about to drive off ourselves, when I heard something large making its way through the trees nearby. 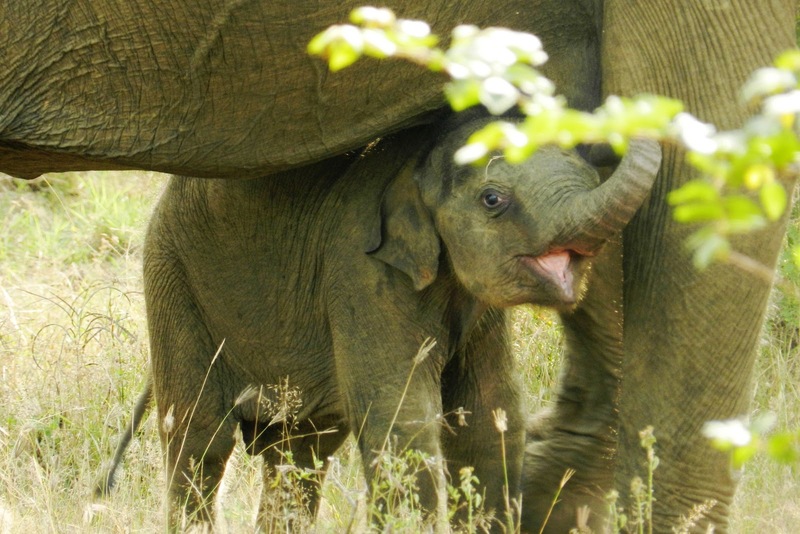 As we sat in our jeep, alone on the narrow dirt road, ten elephants, including several very young babies, came out of the trees and crossed the road around us. They came out of nowhere, sometimes together, sometimes a minute or two apart. Each time one crossed the path and disappeared into the trees on the other side, we'd hear more rustling of branches as another and another came upon us. One of the adults, as though surprised to see us, stopped, circled, and then came back for a closer look and whiff, trying to figure out what to make of us. I could have touched his trunk as he sniffed the air only a few feet away. 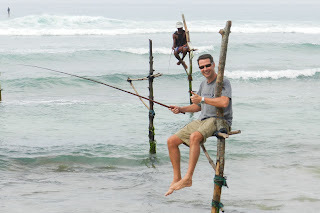 Yesterday I changed my Facebook profile picture to this one taken on our recent spring break trip to Sri Lanka. I can't stop looking at it and it really got me thinking. 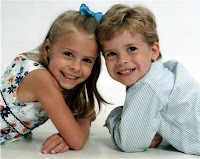 I am writing this because someday, when my children are fighting over who is going to drive the car or the fact that Cooper is dating one of Sophia's friends (sorry Sophia, you're going to lose that one...), I want to pull this up on the internet and show them. And say, "Look at how much you truly LIKED each other!" I'm not talking about love. Most siblings "love" each other. You have to, right? It's just the way it is and how it should be. But I've always said just because you're born into the same family doesn't mean you automatically like each other. Shared DNA isn't an instant lifelong bond - it is simply science. The bond part you have to work at - you need to have common interests and meaningful experiences to really form a relationship. And maybe just a little bit of luck. There is no option to choose your family, but you can certainly choose your friends. So I can't think of anything better than siblings who grow up being best friends as well. Now I'm not an idiot. The fact that I am putting this in writing guarantees jail time for at least one of them. You can laugh when Cooper has been sent off to military school and Sophia comes home all "tatted up". It's not going to be smooth sailing all the time, but someday when they are adults and have their own families, I hope they remember climbing the steps of ancient temples and jumping off of remote island docks holding hands. But I also want them to remember simple things like cheering for each other in basketball and the excitement of finishing the last Harry Potter book at the same time. 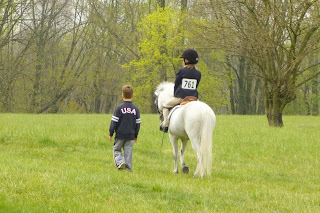 So listen up kids - someday when there is a (hopefully brief!) time you inevitably can't stand each other, please know that there was another time, a long time for that matter, where you absolutely adored each other. And when you're adults, please heed my advice and don't stop exploring the world together. Don't let silly things get in the way of your bond, like trivial arguments or jobs or geography, or even your ego. Go back to Batu Batu and jump off the dock, visit somewhere we never took you, and please...sometimes invite your old folks to join you. Don't just be siblings. Choose friendship.